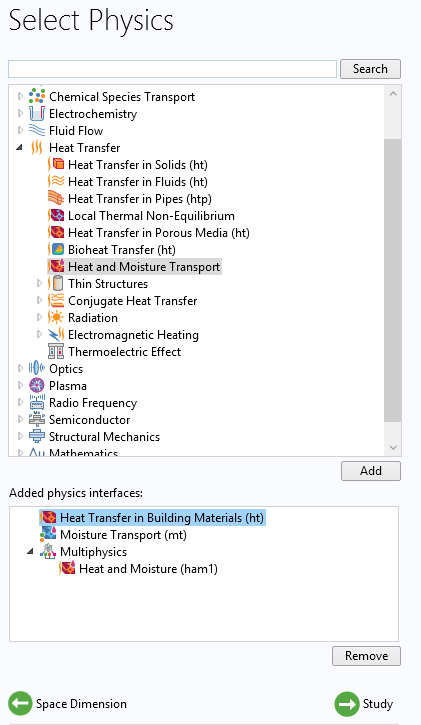 For users of the Heat Transfer Module, COMSOL Multiphysics® version 5.2a brings the ability to incorporate weather data into your simulations, a predefined option to include buoyancy effects in conjugate heat transfer models, new materials in the Bioheat database, and much more. Review all of the Heat Transfer Module updates in further detail below. 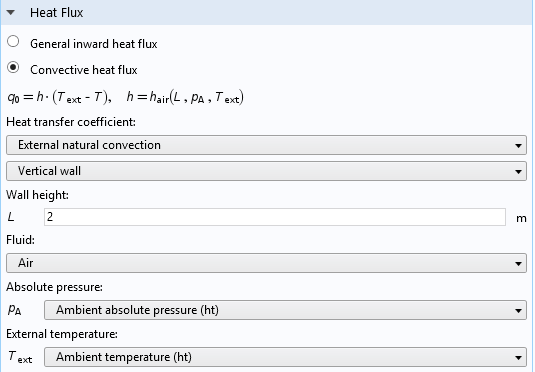 A new section named Ambient Settings is now available in the Settings window of the Heat Transfer interfaces for the definition of ambient variables, such as temperature, relative humidity, absolute pressure, wind velocity, and solar irradiance. After defining these variables once, they are made available as inputs in several features of all the interfaces of the Heat Transfer Module. Specifying ambient variables is, by default, done by the user (User defined). Yet, they can be chosen to be computed from monthly- and hourly-averaged measurements from values provided in the ASHRAE 2013 handbook, which is collated from data measured by weather stations worldwide and provided by the American Society of Heating, Refrigerating, and Air-Conditioning Engineers (ASHRAE). Several settings are available for choosing a location, specific time, and the ambient conditions that are available. This makes it fast and easy to access a wide amount of data in a location that is relevant to your model. The default condition corresponds to the average value for a given date and hour. Among the different possibilities, the user can also access the highest or the lowest temperature recorded by the selected station, or values that correspond to the average values but deviate by one unit of the standard deviation. When transient studies are performed, the climate data is automatically synchronized with the time range set in the solver. Ambient weather data is available in the form of variables as inputs for several features. For example, in the Heat Flux feature, the ambient temperature, ambient absolute pressure, and wind velocity can be used in correlations defining the heat transfer coefficient. Defining ambient conditions at the interface level guarantees consistency in an entire model in addition to avoiding more variable definitions for the ambient data. Using climate data is useful to validate operating conditions of a device based on actual data. Thanks to the multiple condition options, you can test the device behavior in extreme conditions or in standard conditions with the desired margin of safety. Gravity forces are responsible for the buoyancy effects that are observed as soon as there are some density differences in a fluid. Most of the time, these differences in density come from temperature variations in a gas or a liquid. Natural convection corresponds to a configuration where the flow is driven by buoyancy forces and is a key point in many applications, such as energy saving (as natural convection induces fluid motion, it enhances the heat transfer; hence the losses) or electronic cooling (natural-convection-based cooling or fanless cooling is appreciated because it does not involve any mechanical device and it is noiseless). 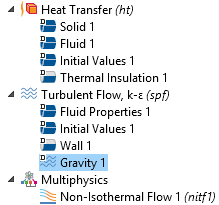 With the new Gravity property, available in the Single-Phase Flow interface, you can easily include gravity effects. When selected, the gravity property adds the Gravity subnode to the model tree, where it is possible to edit the Acceleration of gravity. The Gravity subnode defines a volume force corresponding to the gravity in all the domains where the interface is active. Two formulations are available to implement the fluid flow equation with gravity: the relative pressure formulation (default) and the reduced pressure formulation. When the relative pressure formulation is selected, features that use an external pressure or external total stress allow for the hydrostatic pressure (incompressible flow) or for the hydrostatic pressure approximation (weakly compressible and compressible flow) to be considered. When the reduced pressure option is selected, the flow equations are defined using the reduced pressure as a dependent variable, suitable in cases where buoyancy force variations are small compared to the absolute value of the buoyancy forces. Velocity magnitude of the buoyancy-driven flow (streamlines in m/s) induced by heat dissipated from a chip on a vertical circuit board (temperature in K). A new set of interfaces and features are available for modeling coupled heat and moisture transport in building materials by taking into account heat and moisture storage, latent heat effects, and liquid and convective transport of moisture. The heat and moisture multiphysics coupling can model different moisture variation phenomena in building components. 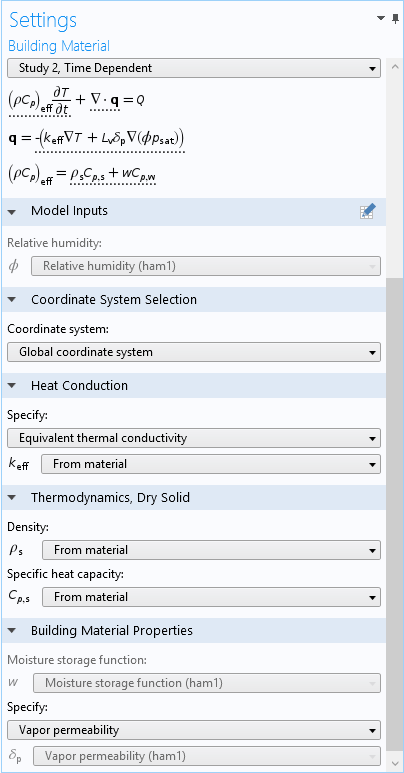 During warmer months, this feature can be used to model the drying of initial construction moisture, as well as condensation due to migration of moisture from outside a building to the inside. During colder months, this feature can be used to model moisture accumulation by interstitial condensation due to diffusion. The Building Material model is the default domain feature of the Heat Transfer in Building Materials interface and can be added to any heat transfer interface. 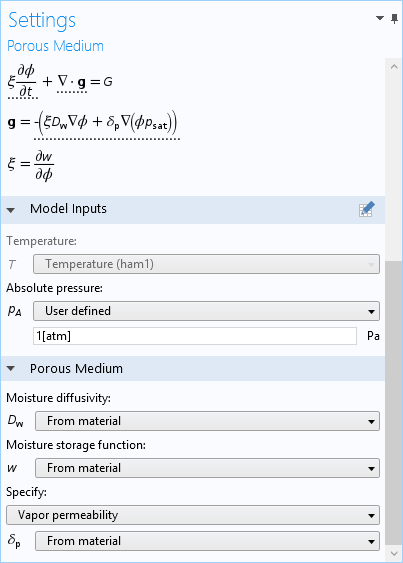 This feature models porous media containing water and moist air, following the partial derivative equations derived from EN 15026:2007 (Hygrothermal performance of building components and building elements - Assessment of moisture transfer by numerical simulation, CEN, 2007). The effective thermal properties are determined from the dry material and water content. Additionally, a heat source or sink term is determined from the moisture transfer and the latent heat of evaporation. The Moisture Transport interface models moisture transfer. The default domain feature, Porous Medium, accounts for the moisture storage, the capillary suction forces, and the convective transport of vapor. Similar to the Building Material feature, it implements partial derivative equations derived from EN 15026. The Moisture Transport interface also provides features to define Moisture Source, Thin Moisture Barrier, Moisture Content, or Moisture Flux. A new feature, Weakly compressible flow, has been introduced as an intermediate option between incompressible flow, where the density is assumed constant; and compressible flow (Ma < 0.3), where the density can change arbitrarily. 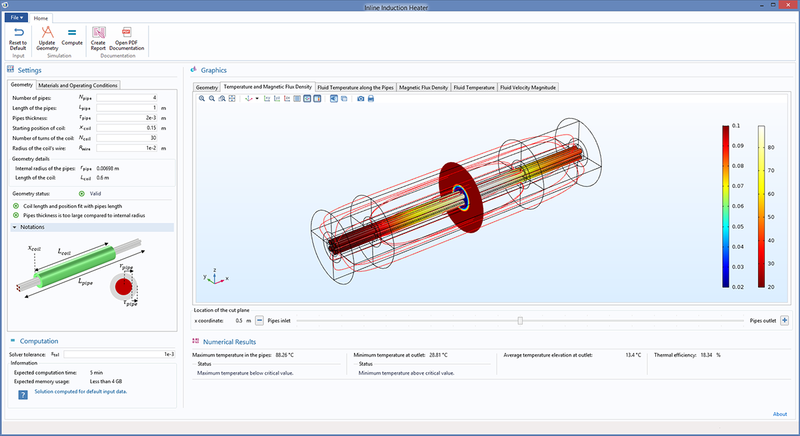 When selected, the Weakly compressible flow feature ensures that the density is temperature-dependent only. If the material properties define a pressure-dependent density, it is evaluated at the reference pressure defined in the interface. This option is particularly useful for gases in cases where the pressure variations are too small to significantly affect the density. This is common in most air-cooling applications at low speeds; in such cases, removing the pressure dependency of the density can greatly improve computational performance. Results from an air cooling simulation where the pressure dependency of the air has been neglected. The plot shows the temperature field (Heat Camera) and the streamlines of the fluid flow (Jupiter Aurora Borealis) where the thickness of the streamlines is proportional to the magnitude of the velocity. A way to reduce computational costs of a simulation is to use symmetry planes or sectors of symmetry to reduce the geometry. From general PDE simulations, symmetry boundary conditions are applicable. Yet, surface-to-surface radiation requires the evaluation of view factors that require the reconstruction of the full geometry during their evaluation. 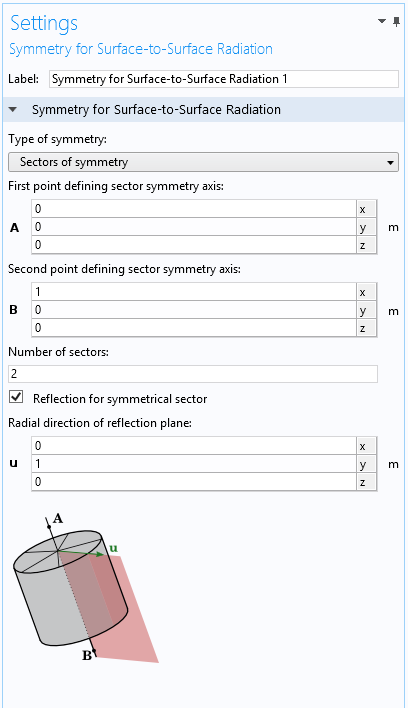 To overcome this requirement, a new option called Sectors of symmetry is now available for 2D and 3D models in the Symmetry for Surface-to-Surface Radiation feature. It supports an arbitrary number of sectors and provides an option to define a reflection plane in each sector. With this option, you can improve the computational efficiency by computing and storing view factors for only a sector of a geometry with symmetry. Additionally, the number of degrees of freedom, for all other model variables in the simulation, decreases accordingly. A classical way of modeling the motion of the liquid phase during a phase change is to solve the fluid flow equation in the whole phase change material domain and then to assign particular properties to the material in the solid phase. This guarantees that the solid part of the material remains immobile or has a rigid body motion. In the fluid part, the actual fluid properties are defined and the fluid flow can be computed. 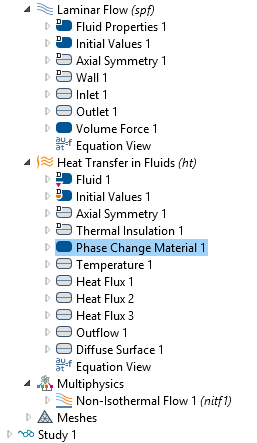 In COMSOL Multiphysics® version 5.2a, you can use the Non-Isothermal Flow multiphysics coupling to couple heat transfer in a phase change material with a fluid flow. The Opaque subfeature used in surface-to-surface radiation has been replaced by the new Opacity feature and is available under all main domain features, including the Fluid (formerly Heat Transfer in Fluids), Phase Change Material (formerly Heat Transfer with Phase Change), Building Material, and Isothermal Domain feature. 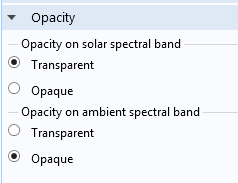 The opacity is set by selecting either Transparent or Opaque in the Settings window. Thin structures introduce high aspect ratios in the geometry, which can be responsible for complicated or distorted meshes. 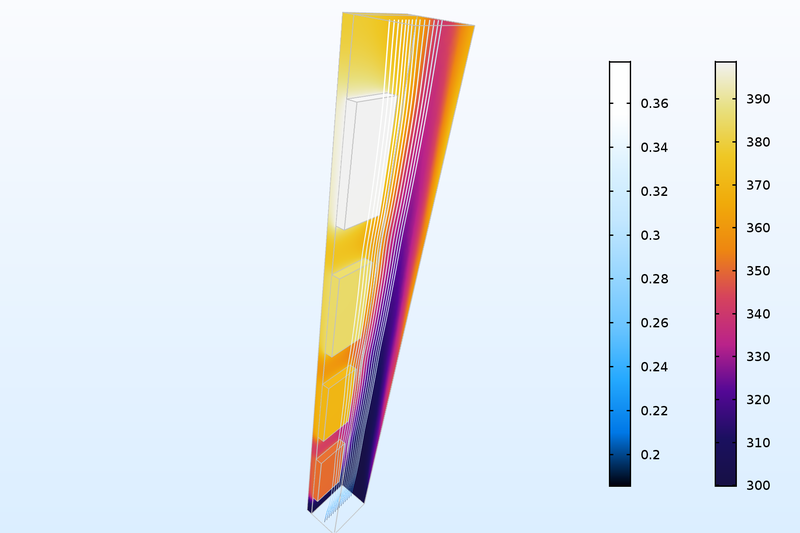 In previous versions of COMSOL Multiphysics®, it was possible to use a shell model for solids using the Heat Transfer in Thin Shells interface. 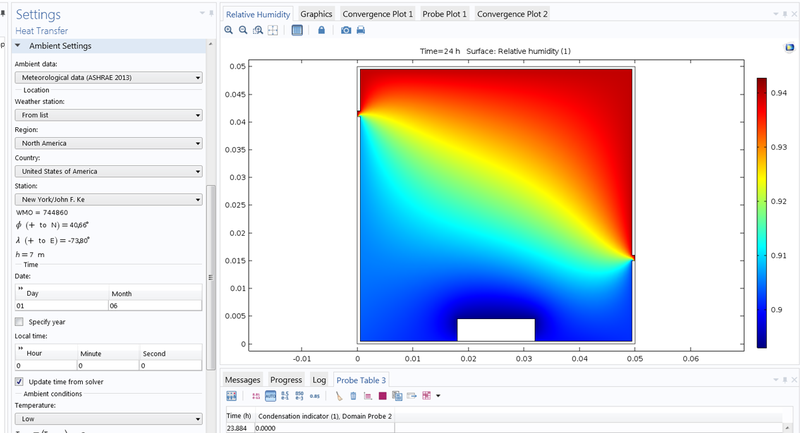 In COMSOL Multiphysics® version 5.2a, you can model thin films (fluid) and fractures (within porous media) as well. 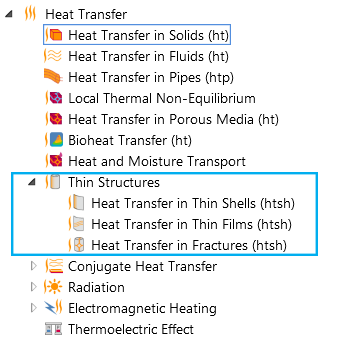 The Heat Transfer in Thin Films interface and the Heat Transfer in Fractures interfaces are available under the Thin Structures subgroup of the Heat Transfer branch in the Select Physics window. The Heat Transfer in Thin Films interface implements heat transfer in fluid equations. The fluid velocity in the film can be entered manually or can be obtained from a Thin-Film Flow, Shell interface. The Heat Transfer in Fractures interface implements heat transfer in porous media equations. The fluid velocity in the fracture can be either user defined or computed from a Fracture Flow interface. Thin Structures interfaces are available in the Heat Transfer node for solids, thin fluid films, and fluids in fractures. A new option, the General thin film model, is available in the Thin Film feature and provides a discretization of the temperature field through the film thickness. This new option defines an extra dimension to account for temperature changes through the film thickness. You can use the Thin Film feature in any heat transfer interface, including the Thin Structures interfaces. This formulation is useful for applications such as bearings modeling or, more generally, when you need an accurate representation of the temperature profile in a film, particularly in the presence of a large heat source or temperature difference across the film. The temperature of the fluid part of a porous medium can be influenced by work done on it by pressure changes. In order to reflect this in models, the Pressure Work feature has been updated to support porous media in addition to free fluid flow and is now available as a subfeature of the Porous Medium node. Depending on the approximation used in the Thin Structure feature, temperature on the sides of a thin structure may be uniform (the Thermally Thin approximation) or vary over the thickness (Thermally Thick approximation or General option). 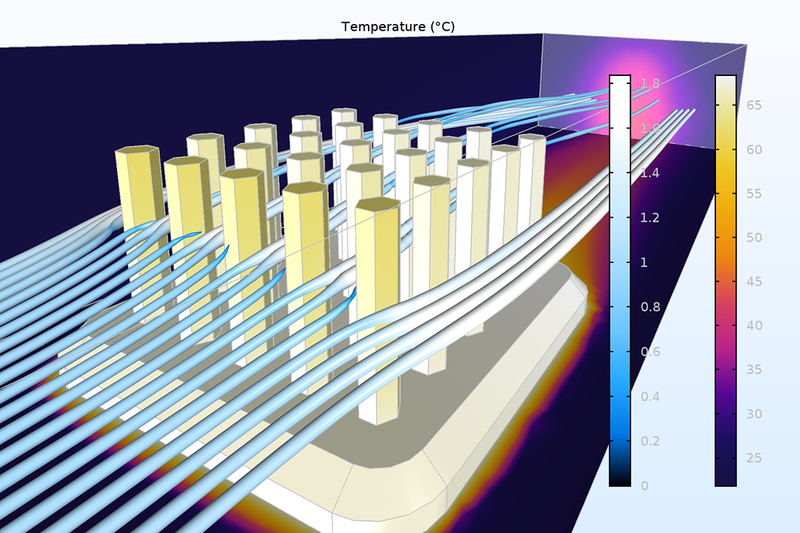 In COMSOL Multiphysics® 5.2a, the Thin Structure interfaces have been updated so that the Surface-to-Surface Radiation features — Diffuse Surface, Diffuse Mirror, or Prescribed Radiosity — use the surface temperature of the thin structure from the side where the radiation is emitted. The surface temperature is, for example, used to define the surface emissive power, which is evaluated based on Planck's law. For almost all of these materials, temperature-dependent properties are provided through linear or polynomial expressions; for the rest, constant values are given. 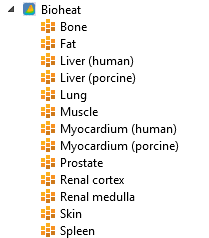 Additionally, the properties for the Prostate material have been updated. Ferritic stainless steels have become more and more popular in the food industry because of their relatively low and stable price and due to the absence of nickel in their components. Their resistance to corrosion can be improved by adding chromium or molybdenum, and their magnetic properties offer new techniques in food processing. The new Inline Induction Heater application computes the efficiency of a magnetic induction apparatus for heating liquid food that flows in a set of ferritic stainless steel pipes. A circular electromagnetic coil is wound around a set of pipes in whichliquid food flows and is heated. A magnetic field, resulting from current passing through the coil, generates eddy currents, which are responsible for the inductive heating. Finally, heat is transferred to the fluid, essentially by conduction. With this app, you can investigate various sets of pipe configurations by changing their number, length, thickness, and material. You can also tune the coil by setting the number of turns, wires radius, current density, or excitation frequency. In order to optimize the design, the application reports the overall maximum temperature of the fluid, minimum temperature at the outlet, the average temperature elevation at the outlet, and the thermal efficiency of the heater. Inline Induction Heat app interface, showing the temperature and magnetic flux density. Evaporation in porous media is an important process in the food and paper industries, among others. Many physical effects must be considered: fluid flow, heat transfer, and transport of participating fluids and gases. All of these effects are strongly coupled and predefined interfaces can be used to model these effects with the Heat Transfer Module. 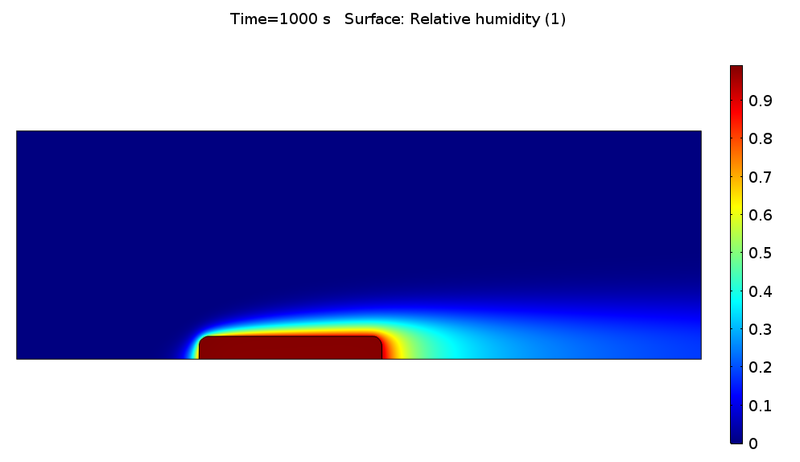 This tutorial model describes an arbitrary case of drying a wet porous object using laminar air flow. The air is dehumidified at the inlet to the porous object where its moisture content increases as it flows through the porous medium. 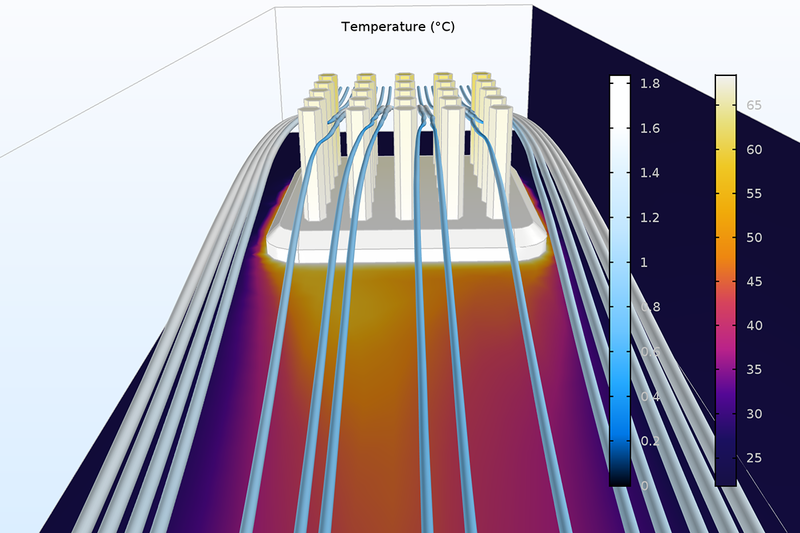 The model focuses on the steps required to implement simulate multiphase flow in porous media, in the Heat Transfer Module, together with the evaporation of the liquid to a gaseous phase. Water saturation in the porous medium is computed over time. Relative humidity profile induced by a humid porous medium in a dry flow.